I like putting booze in sweets. There’s something enticingly sacrilegious about it. Cakes and cookies are sweet, innocent treats that are just about the simplest pleasures one could derive from life. 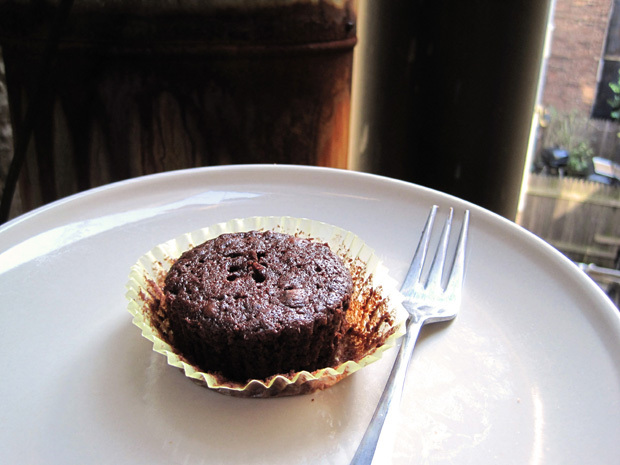 But putting booze in a cupcake is like injecting vice into the guileless dessert; it’s naughty – but I like it. The red wine does not bake off, so you definitely get to taste it. I really like how the cocoa powder and the cinnamon in the recipe sets it off. I think this recipe is ideal if you like red wine – I’m not a huge red wine person but I simply had some around the house that was just itching to be used. I also halved the original recipe and omitted the extra egg yolk, and I don’t think it missed the additional fat. Make the cake: Preheat the oven to 325°F. Line the bottom of a 9-inch round cake pan with parchment, and either butter and lightly flour the parchment and exposed sides of the pan, or spray the interior with a nonstick spray. In a large bowl, on the medium speed of an electric mixer, cream the butter until smooth. Add the sugars and beat until fluffy, about 3 minutes. Add the egg and yolk and beat well, then the red wine and vanilla. Don’t worry if the batter looks a little uneven. Sift the flour, cocoa, baking soda, baking powder, cinnamon and salt together, right over your wet ingredients. Mix until 3/4 combined, then fold the rest together with a rubber spatula. Spread batter in prepared pan. Bake for 25 to 30 minutes, or until a cake tester inserted into the center comes out clean. The top of the cake should be shiny and smooth, like a puddle of chocolate. Cool in pan on a rack for about 10 minutes, then flip out of pan and cool the rest of the way on a cooling rack. This cake keeps well at room temperature or in the fridge. It looks pretty dusted with powdered sugar. Make the topping: Whip mascarpone, cream, sugar and vanilla together until soft peaks form — don’t overwhip. Dollop generously on each slice of cake. It can also be covered and refrigerated for up to 4 hours. Notes: I halved the recipe and made 7 cupcakes, and baked it for about 20 minutes. But definitely start checking at 15, because oven temperatures vary across the board.